At the end of yesterday’s President’s Cup match, San Ġiljan Salini Resort must have been relieved to prevail against an obdurate and tactically disciplined Neptunes Grimaldi side and thus land the President’s Cup after edging their opponents by six goals to five. In so doing, the Saints had the satisfaction of completing the array of honours currently in their possession after winning the championship and knock-out last year and then the 2016 Winter League title. Their team had to dig desperately into their reserves of knowhow to scrape through even if they led all the way, once by three goals and then by two. However, they could not quite put the game to bed as Neptunes, significantly operating with a much thinner squad, kept nibbling into their lead until Aurelien Cousin netted the winning goal three minutes and 47 seconds from the end. The Marsascala players celebrate at the end of their match against Marsaxlokk, yesterday. Peter Borg had been the Saints’ chief scorer with three goals but the Reds, whose inexperienced squad were further depleted by the absence of Jordan Camilleri, kept fighting all the way to keep the result in the balance until the very end. The cup was presented to the San Ġiljan captain Matthew Zammit by ambassador Anthony Miceli Demajo, on behalf of the Community Chest Fund. In the opening match, Marsa-scala Nutrition Empire retained the Sports Journalists Cup when the edged Marsaxlokk Fischer 11-10 in a tight Division One clash. It was close, with three sessions being drawn, only for the third quarter which Pierre Borg’s team won 2-1, dividing the contestants. The match had three scoring protagonists, Jean Claude Cutajar and Gabor Kovacs with four goals each for the winners, and Ivan Basara with a nap-hand for Marsaxlokk. San Giljan: J. Sammut, P. Borg 3, A. Galea, B. Vapenski 1, Darren Zammit, M. Zammit, K. Galea, C. Mercieca, B. Plumpton, A. Cousin 1, P. Fava, Dino Zammit 1, D. Camilleri. 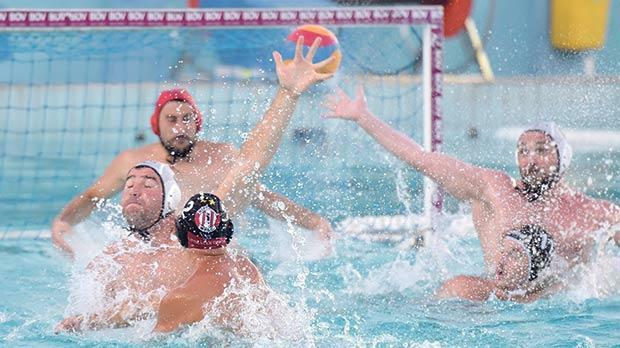 Neptunes: A. Borg Cole, N. Lanzon 1, C. Radu, M. Cutajar, T. Agius 1, M. Lanzon, S. Camilleri 1, K. Erdogan, J. Abela 1, M. Zammit 1, B. Lanzon, M. Azzo-pardi, M. Castillo. Referees: M. Dalli, D. Rotondano. Marsascala: K. Schembri, J.C. Cutajar 4, J. Busuttil, C. Bonello 1, J. Bajada, L. Grixti, G. Kovacs 4, J. Cremona 1, S. Micallef 1, M. Pace, D. Cassar, O. Zammit, B. Dougal. Marsaxlokk: D. Abela, C. Spiteri de Barro 1, L. Calleja, K. Galea, C. Gialanze 1, C. Bugeja 1, S. Meli, I. Basara 5, R. Scerri 2, K. Navarro, G. Busuttil, A. Xuereb. Referees: P. Balzan, F. Romolini.